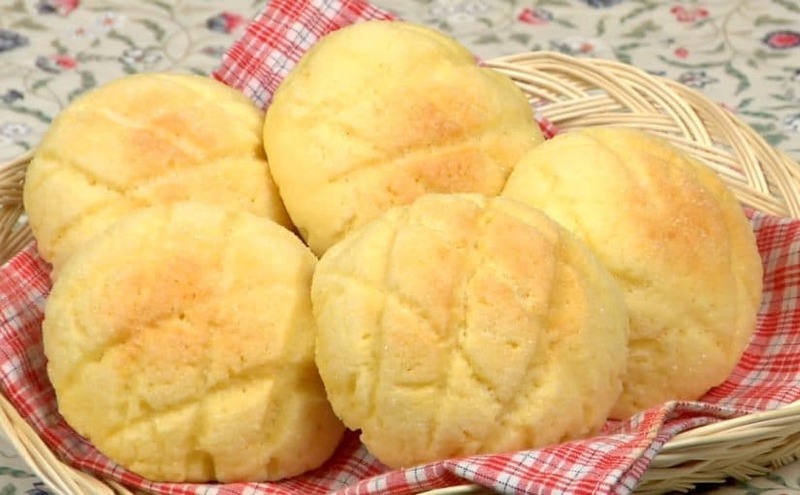 Melonpan are Japanese sweet buns covered with a thin layer of cookie dough. They take many steps to make but freshly-baked Melonpan are scrumptious! Time for chilling cookie dough, fermenting and resting bread dough are not included in cook time. 5 g Non-Fat Dry Milk Powder if dry milk powder is not available, use lukewarm milk instead of the lukewarm water. * The ingredients contain Amazon affiliate links. Let's make the cookie dough first. 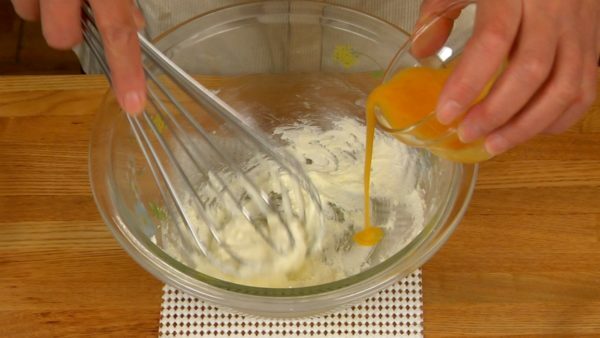 Whisk the butter until creamy. 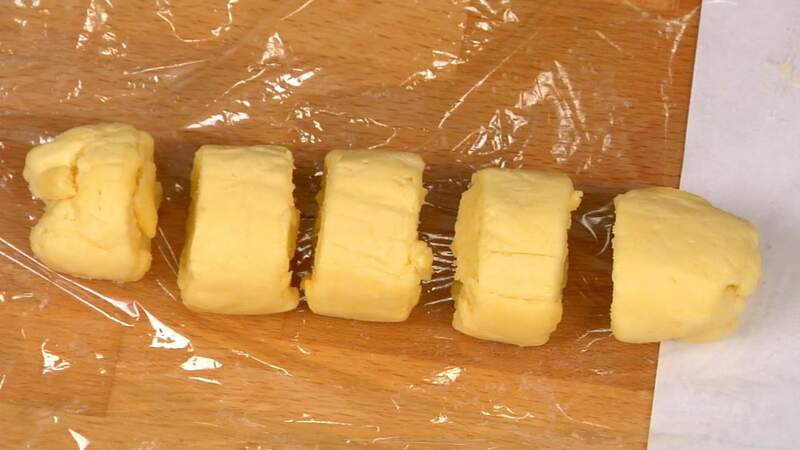 Gradually add the sugar, mix and dissolve in the butter. When the color turns to white, gradually add the beaten egg and mix. Do not add the egg at once, otherwise the butter will separate. Bring the butter and egg to room temperature (approx. 20°C/68°F) before use. This will make them easier to mix and the sugar will dissolve better. Add the baking powder to the cake flour and mix with a spatula. Sift the flour mixture into a bowl. Sift it again. 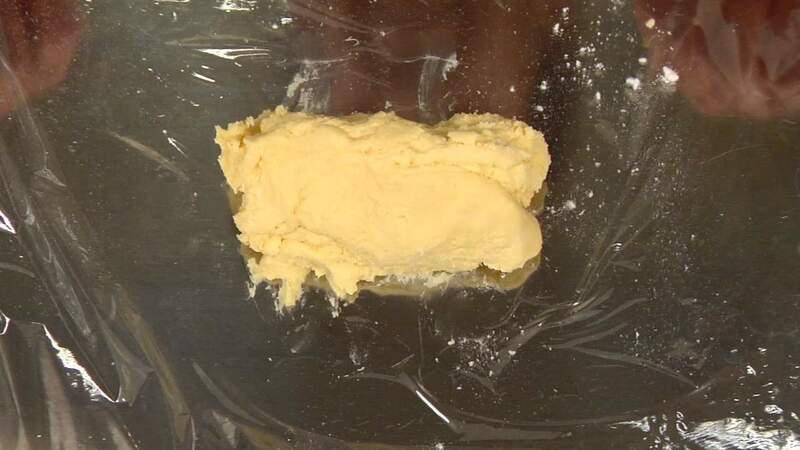 Add one third of the cake flour to the butter mixture. Lightly mix with a spatula. Add another one third of the flour and lightly mix. Add the rest and stir until all the flour is thoroughly mixed. Be careful not to overmix the dough. Place the dough on the cooking tray covered with plastic wrap. Rub bread flour on your hands and shape the dough into a cylinder. Cover with the plastic wrap. Cool down the cookie dough in a fridge for over 1 hour. Let's make the bread dough next. 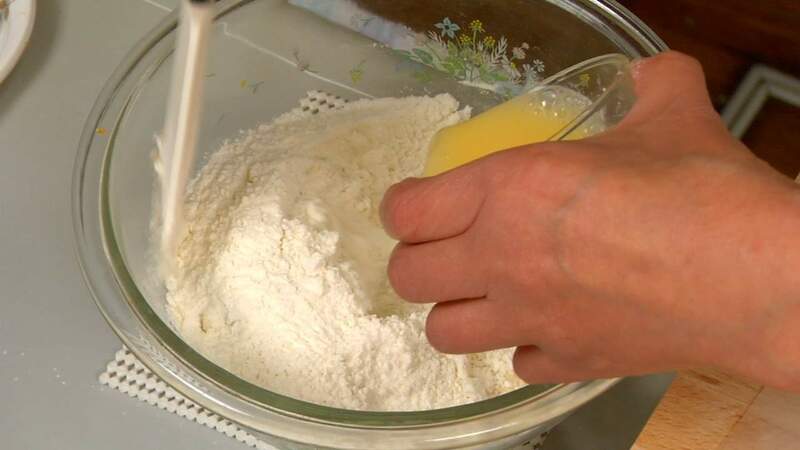 Add the sugar, salt, non-fat dry milk powder and instant yeast to the bread flour. Whisk the flour mixture well. Dilute the beaten egg with the warm water. 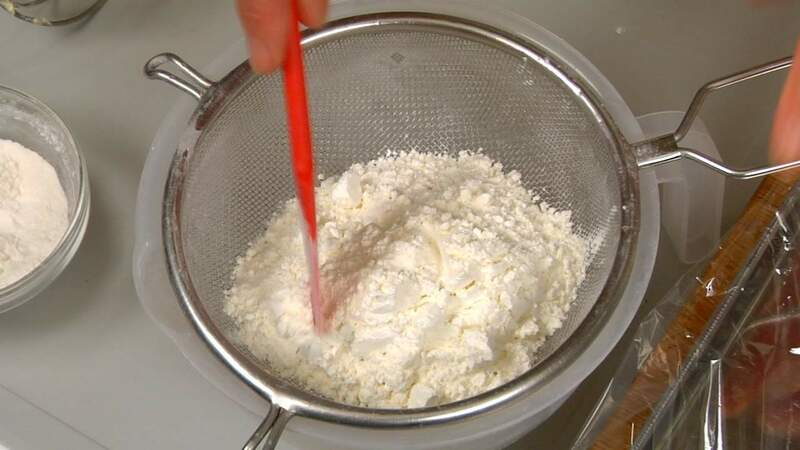 Gradually pour it into the flour and stir with a spatula until evenly mixed. Clean the spatula with a scraper and place the flour mixture on a pastry board. 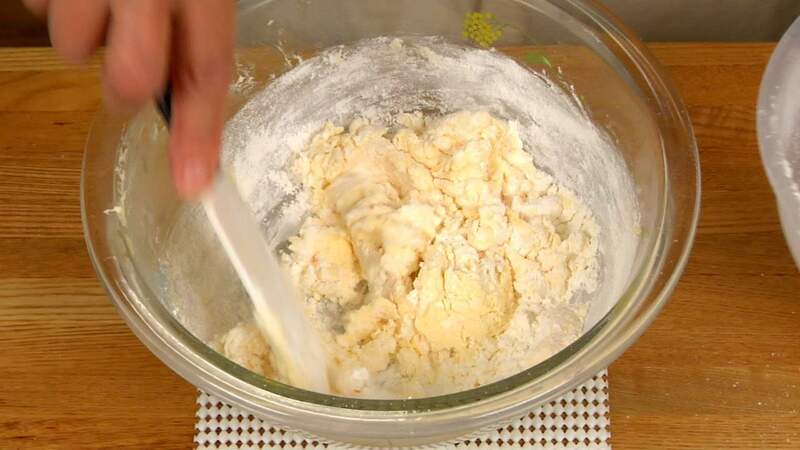 Gather the crumble flour mixture and form it into a ball. Briefly knead it with your hands. 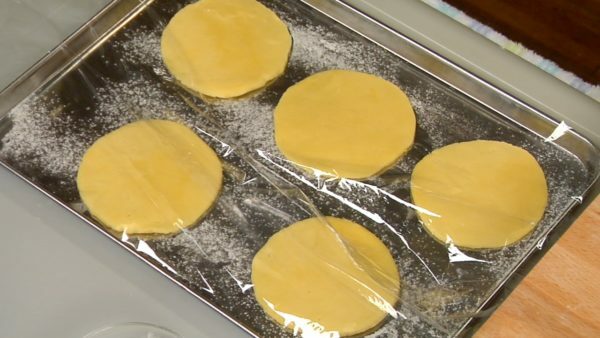 Throw the dough on the pastry board, fold it away, grab the side of the dough and throw it again. Gather the dough with the scraper. 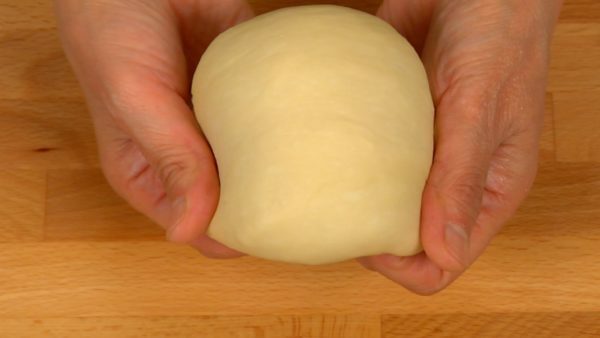 Knead the dough with your hands using your body weight. Repeat this process until the dough is less sticky. 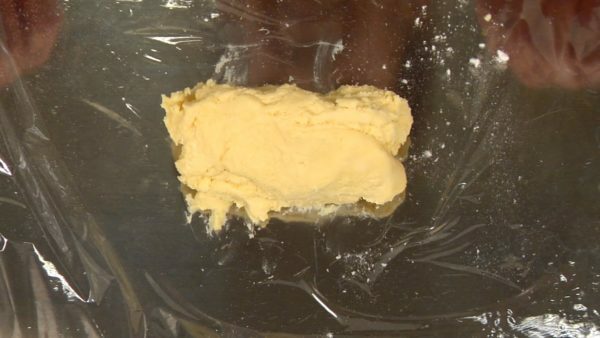 Flatten the dough and spread on the butter. 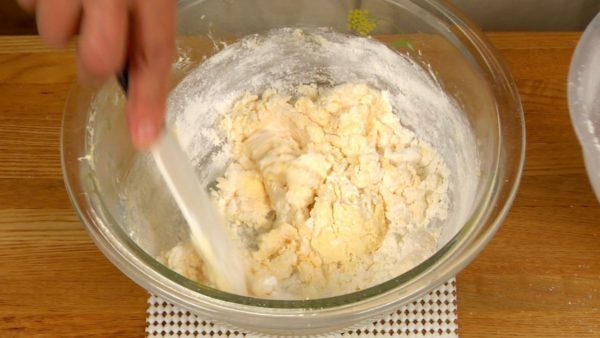 Gather the rim of the dough toward the center and knead in the butter. 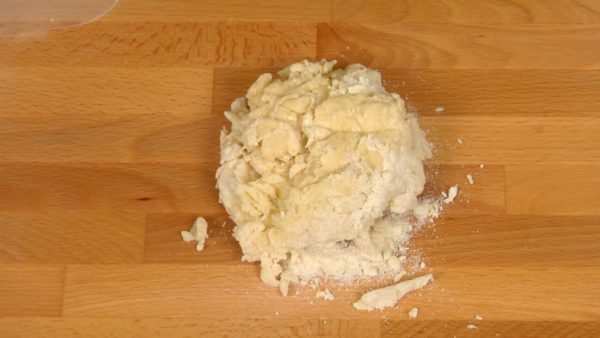 When the butter is mixed in, gather the dough with the scraper and form a dough ball. Like shown before, continue to throw the dough on the board. Knead the dough on the board and throw again. Repeat this throwing and rolling process for 10 minutes. The dough is now smooth and glossy. 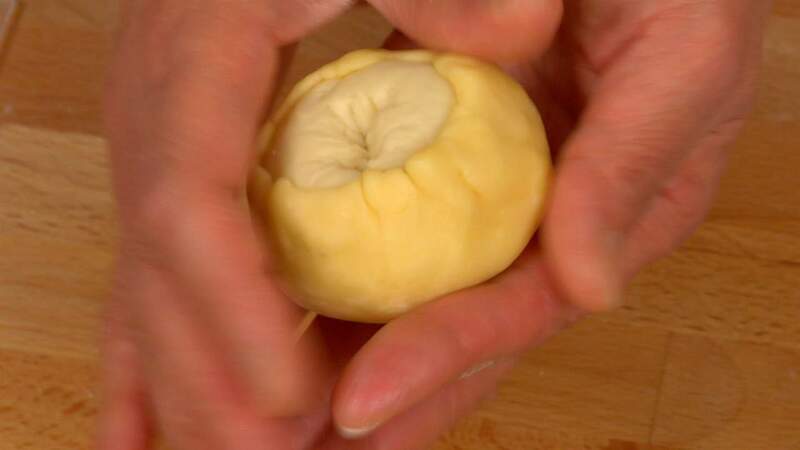 As shown in the video, shape the dough into a ball and replace it in the bowl. Cover with plastic wrap and let it sit in a warm place for 40 minutes. This conventional oven can keep its inside warm for fermentation. The dough has now risen by 50% in volume. Remove the plastic wrap. 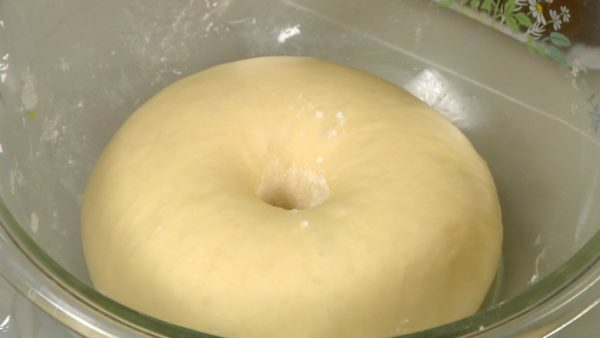 Dip your finger in bread flour and make a hole in the dough. If the hole quickly disappears, the dough needs more fermentation. Measure the dough to get the total weight. Dust bread flour on the pastry board and put on the dough. 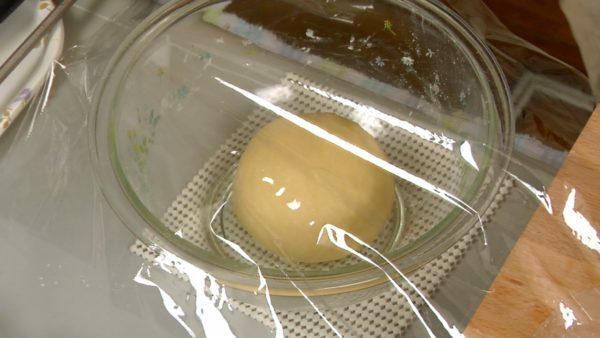 Flatten the dough and remove the gas inside. Roll the dough into a long cylinder. Divide the pre-measured dough into 5 even pieces. Make sure they are equal in weight. Spread the dough toward the other side of the cutting surface. Shape each dough piece into a ball. Make sure the bottom is tightly closed. Line up the dough balls on the cooking tray dusted with flour. 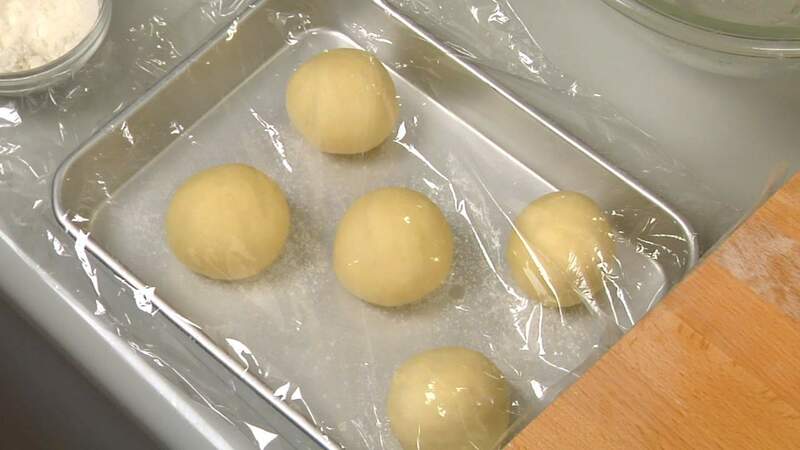 Cover with plastic wrap and let them rest for 20 minutes at a room temperature. In the meantime, let's shape the cookie dough into round sheets. Divide the dough into 5 pieces. Measure each piece and make sure they are equal in weight. Put a bit of bread flour on your hands and shape each dough piece into a ball. 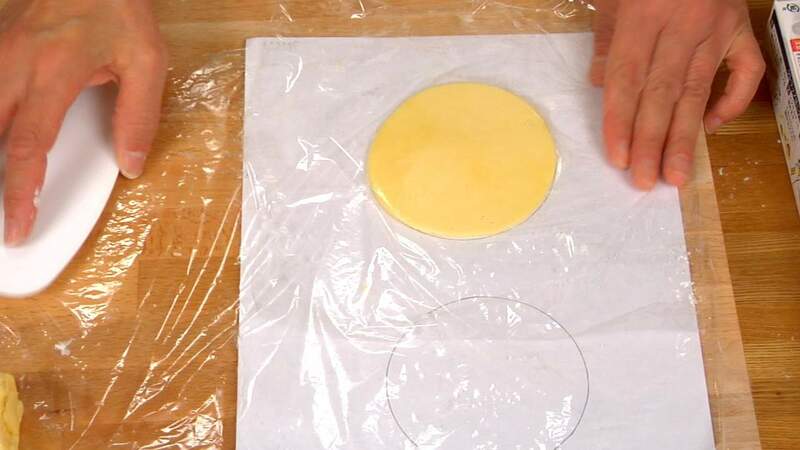 Place the ball on plastic wrap, cover with another wrap and press with the side of the scraper. Placing a 9 cm (3.5") diameter drawing under the wrap will help you get an equal set of cookie sheets. Line up the cookie sheets on the cooking tray dusted with flour. Sit the tray in the fridge while the bread dough is resting. This will make the cookie dough easier to handle. Let's shape the dough into Melonpan. Reshape each bread dough into a ball, cover with the cookie sheet and adjust the shape. Hold the dough upside down and stretch the cookie sheet up to the center. Pinch the bottom of the bread dough and dip the cookie dough in sugar. 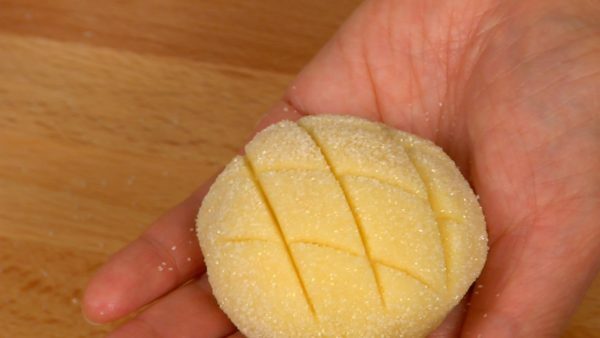 Hold the Melonpan on your palm and make a diamond pattern on top with the scraper. Line up the Melonpan on the baking sheet covered with parchment paper. Let the Melonpan sit in the warm place for the second fermentation. This conventional oven can keep the inside at 37 °C (99 °F). 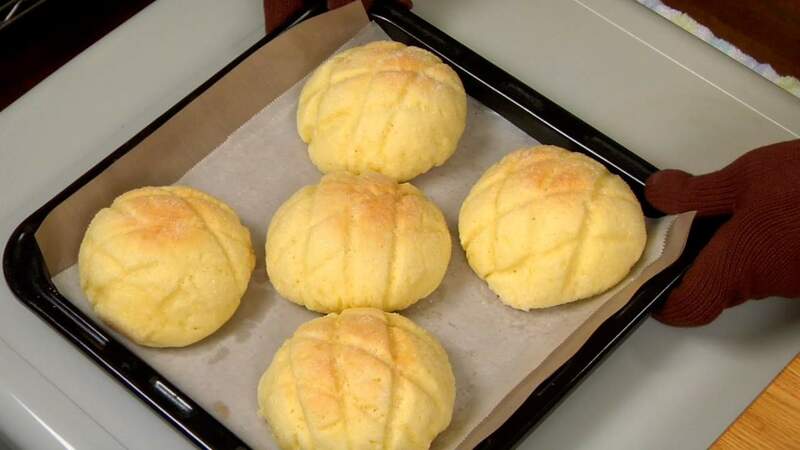 After 40 minutes of the second rise, the Melonpan are almost doubled in volume. Let's bake the Melonpan. 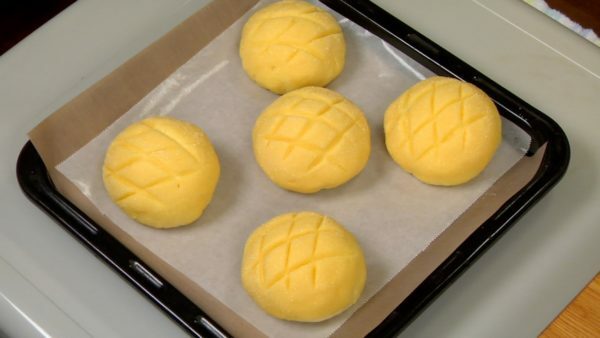 Preheat the conventional oven at 170°C (338 °F) and bake the Melonpan for about 12 minutes. 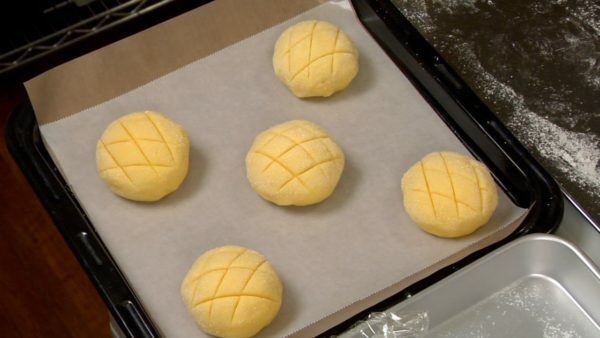 When each Melonpan gets slightly brown on top, remove the baking sheet from the oven. Cool them down on a cooling rack and they are ready to serve! If johakuto or powdered sugar isn’t available, grind granulated sugar with a blender or food processor. If you don’t have the equipment, you can also use regular granulated sugar but mix until the mixture doesn’t have a grainy texture and it is combined thoroughly. We used johakuto sugar in this recipe. Johakuto is the most commonly used sugar in Japan and has a slightly moist texture. 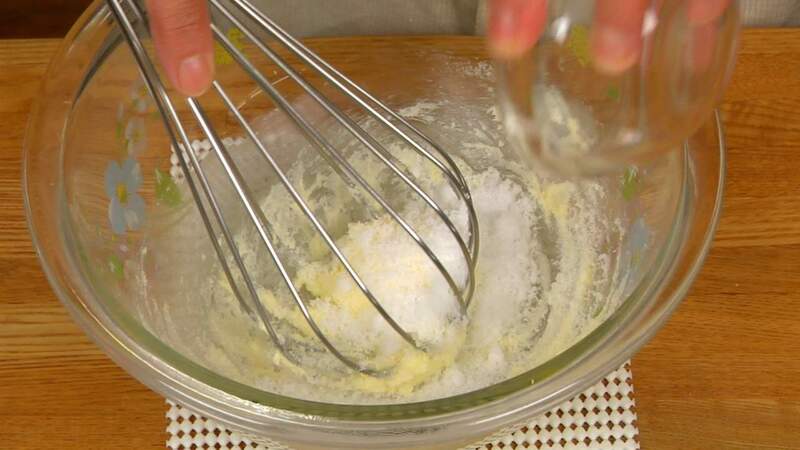 When making the cookie dough, remove the butter remaining on the balloon whisk thoroughly, and add it to the bowl. This process is important to keep the measurement accurate. Be sure to bring the egg and butter to room temperature (approx. 20°C/68°F). When you push the butter with your finger, it should be soft enough to form a dent. The fermentation time depends on its temperature so be careful not to over-rise the dough. You can also let the dough rise in a styrofoam box filled with warm water. In that case, cover the bowl with a plastic bag and make sure the steam won't wet the dough. Hi! I have prepared many of your recipes and they all turned out perfectly every time!! Now I really want to try this recipe next and I was wondering if the quantities of beaten egg are correct…. Is it really 1 Tbsp of beaten egg for the bread dough?? Thanks! Yes! The quantity of the beaten egg is 1 tablespoon! Be sure to measure all ingredients by weight using a kitchen scale. 🙂 Also check the recipe note. The comments below the recipe will help you make the melonpan too! Thank you for the quick reply! They came out fantastic!!! Yum! I lived here in Tokyo for one year and enjoyed the melonpan so much I want to make it when I get home to the US in a few weeks. I read all the comments. Do you think I should use powdered sugar instead of granulated sugar as suggested in 2 of the comments? Use powdered sugar or grind granulated sugar with a blender or food processor. If you don’t have the equipment, you can also use regular granulated sugar but mix until the mixture doesn’t have a grainy texture and it is combined thoroughly. 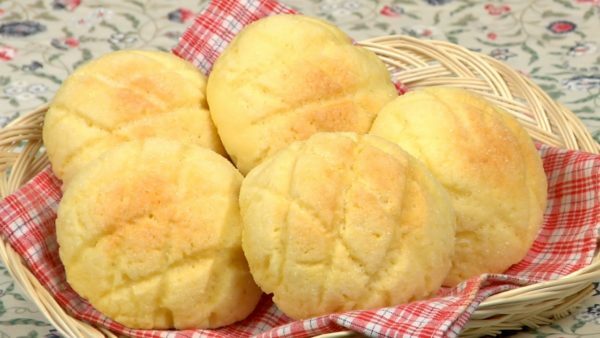 Do u have any suggestions my first time melon pan is very hard , what I did wrong ? Sorry for the late reply. This is just a possibility but how about reducing the baking time next time? 🙂 If the temperature in the oven is too high or the baking time is too long, the moisture is evaporated and the bread will dry out.